Easter is coming! Everyone knows that rabbits love peanut butter. My mother only made these for Easter, and what made them extra special was that my sister didn’t like them, so they were all mine! They are similar to Rice Krispie treats only tastier (because of the peanut butter). The smell of the brown sugar, coconut and peanut butter melting together is intoxicating – and as a bonus these cookies are vegan, gluten-free and dairy-free, so eat up! If you don’t like jelly beans, feel free to use candy-covered chocolate eggs instead, just make sure the nests are room temperature first. Happy early Easter! 1. Combine cereal and coconut in a large bowl. In a medium saucepan, bring the remaining ingredients (corn syrup, brown sugar, peanut butter and vanilla) to a boil, stirring constantly. Pour into the bowl and stir until well mixed. 2. Let mixture sit until it is cool enough to handle, but the hotter it is the easier it will be to work with. Grab a small handful, squeeze together and shape into a nest. Place 3-4 vibrant jelly beans in the center. Let cool completely and store in a sealed container. Makes about 12-15 cookies. peanut butter + coconut = so not a Hollywood marriage. it’s built to last, yum! Lovely photo, but I have to look away now because my teeth are screaming, aahhh! They’d be great to take on a hike no? I can imagine biting into one of them on top of a Dorset hill, looking out to sea. No hang on, my teeth hurt. They look so cute and yummy I could eat 10 right now, but I am on a diet (?) hehe. Great recipe. These look fabulous. I’d have to substitute cashew butter, I think – it would go better with the coconut than almond butter, which I would usually use here. They’re such a creative idea! Like the idea of the brown cereal and the use of candy as a topping. What a sweet treat. sweet, these are vegan too. Can’t wait to make them. Oh, Nick, you’re becoming SO gluten-free! And depending on the peanut butter you use, these could be dairy-free as well. I LOVE it! And I like the thought of coconut and peanut butter together. Yum! elle, I love those m&m eggs! Ben, these are almost diet food! There is not all that much sugar in them compared to the other ingredients which are genuinely healthy. Fearless Kitchen, they’d go great with any nut butter, but honestly peanut butter and coconut is an exquisite combo – you must try! Veggiegirl, correct! Moderation is key, which means that giving these away to my roommates so I only had 1 left to eat was a very good idea! These look great! I will sure be making them soon! Great Recipe. Those nest cookies look great! Ooh these look SO good!! Well done. I might have to forgo the jelly beans for something vegan though. =) Do you think chocolate chips might taste good with this? So, when they’re all gone, do you have…empty nest syndrome? YUM! Those are really cute… and I just maaay have almost all of the ingredients at home already. Sweet! Oh my gosh these things taste amazing! My friend makes something like them..so good! These are absolutely adorable! What a fun thing for your Mom to make you! Love the recipe! It’s so simple yet yummy!! Looks like they’d be fun to make with kids. OMG i just stumbled across your blog and i SO WISH i had known about it sooner! I lovelovelove peanut butter and i love your blog! the pictures are awesome and i can’t wait to try out these recipes! Those look great! I’m definitely going to have to make them. Smart mom. And cool son for taking after her. Those morsels look seriously dangerous. nick these totally rock! and you used brown rice, good thinking! I am totally trying these. I know a little girl who would just love these, especially those jelly beans on top! Any substitution ideas for coconut? Or can it be omitted? What a fun Easter treat!! What a sweet treat. I would put a peep in the middle! 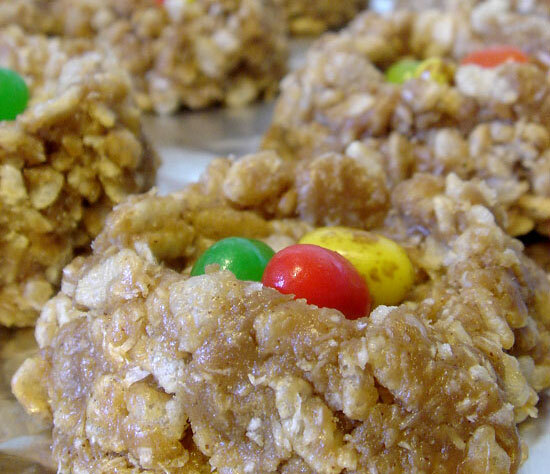 I love that these birds’ nests cookies bring back such fabulous memories! They certainly look delicious. I love the coconut and PB combo. Fantastic! Wonderful! I think I’d substitute M&Ms for the jelly beans…because you can’t beat chocolate and PB. These are so so cute! These are sooo cute! I love when recipes are special like that. Thanks for sharing! Mmm, mmmm, mmmmm, mmmmmm, mmmmmmm! Love bird nests, especially when they have 1) PB, 2) EGGS! These look so delicious!!!! And no gluten – nice! Love these! I thought at first those were m&ms and was almost disappointed to find out they were jelly beans (like I was actually going to eat them or something) – but I like the twist! …and uh, I suppose I could use m&ms if I made them. Oh my Nick, my husband would love these. OK, I would too. :) Not a jelly bean fan, but I’m thinking they’d be great with a little chocolate in the center! What an interesting recipe. Not sure where to get brown rice cereal but I’m guessing regular corn flakes may work too? I guess I don’t know what brown rice cereal is. a google search reveals a wide variety of possibilities. Please give a hint with a brand name or grocery section? It looks like a real birds nest. How cool is that! Haha love the nutritional facts are per “nest”! I don’t do Easter foods and traditions (do Passover) but these little guys look entirely too bad for my hips; and that, I love! “what made them extra special was that my sister didn’t like them, so they were all mine!” – you just made me laugh out loud at this, haha!